The atomic age arrived on December 2, 1942, when Enrico Fermi produced the first controlled, self-sustaining nuclear chain reaction. He did this in a laboratory under the Stagg Field bleachers at the University of Chicago. That work led to the development of the nuclear bomb as well as to peaceful applications of nuclear power. As a faculty member at the University of Rome, Fermi won the 1938 Nobel Prize in physics for producing artificial radioactive substances. Fearing for his Jewish wife, Laura, because of Fascist Italys anti-Semitic legislation, he brought his family to the United States directly from the awards ceremony in Stockholm. 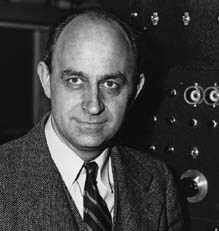 Fermis suggestion that the United States could develop atomic weapons led to his work at the University of Chicago from 1942-1954. There he constructed the nuclear reactor as part of an enormous secret wartime effort called the Manhattan Project. He and his team then were sent to New Mexico to develop the atomic bomb. After the war, Fermi returned to the University of Chicago and taught there until his death. Fermilab, the U.S. Department of Energys national laboratory in the western suburbs, is named in his honor. 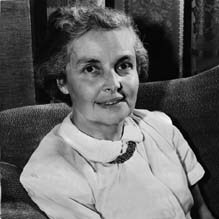 Laura Fermi became a writer and political activist. Her books reflected the spectrum of her experience. Illustrious Immigrants: the Intellectual Migration from Europe 1939-41 and Atoms in the Family: My Life with Enrico Fermi are among her best-known works. The Fermis lived here at 5537 South Woodlawn Avenue.